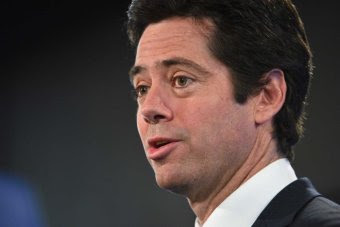 Gillon McLachlan earned $1.7 million in his first full year as AFL chief executive. The league's revenue also reached half a billion dollars for the first time, with an increase of $33m to $506m. The AFL released its financial accounts on Monday ahead of the league's March 17 annual general meeting. Last year's figures showed that McLachlan had earned $1.3m in his first seven months as the AFL's boss. He and his predecessor Andrew Demetriou had received a combined $3.3m for the year. The AFL's profit dropped by $10m to $2.5m, which the league said was expected. AFL expenditure also was up, increasing by $12.7m to $168m. The AFL distributed $245.2m to clubs, up from $218.3m in 2014. The league also negotiated its record $2.5 billion broadcast rights agreement, set to start next year. "During our 2015 financial year, the code has grown its revenue, spectacularly increased our digital footprint, grown our corporate partnerships and club memberships and held strong ground with our attendances and ratings," said AFL commission chairman Mike Fitzpatrick.